Arise and take your rightful place on the Firstborn throne! Return your kingdom to its former glory by growing its armies and lands. Choose heroes that will lead your armies to victory in battles against countless players across the globe. Gather your friends to form unstoppable Alliances in the most immersive MMO Real-Time Strategy game on mobile! 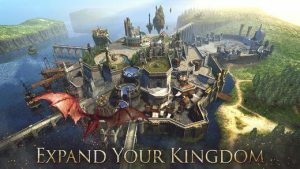 A fully-realized world for players to conquer, beautifully-crafted in full 3D graphics! Build, strategize, and form Alliances to battle against millions of players around the world. Carefully choose unique Heroes to Level up and provide equipment to maximize the potential of your Castle and armies. Forge, customize, and level up your heroes as you gain huge advantages over opposing kingdoms. Experience two different stories: strategically position your troops to battle the vile horde in Dimensional Battles, then traverse through your township to take on exciting quests and defeat nefarious monsters for massive rewards! This app offers in-app purchases. You can disable this feature by adjusting your device’s settings.